Arisaema for sale UK. Buy Arisaema tubers today! Rare Arisaema. Out of all the Aroid genera we grow, Arisaema are our favourite. We grow an extensive collection of over 70 species plus numerous cultivars. During their dormant season we offer a large range of Arisaema for sale. We only sell our Arisaema as dormant tubers or bulblets during their dormant period. This means that the majority are available from late autumn through to spring. We occasionally have seeds for sale. Our Arisaema are always in high demand. If it is not currently listed for sale, then unfortunately we do not have it ready. Arisaema is a wonderful genus containing many garden worthy plants. Commonly known as ‘Cobra Lilies’ due to the reptilian appearance of the spathe in one or two species. Many species are UK hardy provided they have good drainage and avoid winter waterlogged soil. Any exceptions are noted in the species description. A number of our plants are only ever available in very small numbers. We offer a selection of extremely rare species as bulblets. Please read the description carefully. It is important to note that only ‘home grown’ tubers are sold on these pages. We do not sell imports, and as such, our plants are of higher quality than many sold elsewhere. If we do import tubers, they are always grown on first before being sold. This ensures that they are correctly ID’d and healthy. 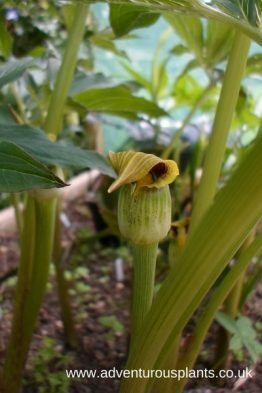 Please see this webpage for more advice when buying Arisaema.